The Sedona Rouge Hotel and Spa is one of the most stylish and comfortable venues Sedona has to offer. No wonder brides having a Sedona wedding often select the lovely property as their venue. Situated in the picturesque “Red Rock Country” of Sedona Arizona, this splendid hotel possesses an interesting dichotomy. All kinds of services one would only expect to find in an urban setting is available near the Rouge. Yet, this great Sedona property is located only about mile from some of the best hiking trails that wind around hundreds of acres of the Coconino National Forest. There are so many advantages in choosing the Sedona Rouge as a destination for weddings and events that it is hard to know where to begin. The suites are incredibly comfortable and beautiful. The Sedona Rouge Hotel & Spa is unique in its lovely Mediterranean design blending all the elements of its dramatic setting into a unique blend of Andalusian elegance. Its stylish Mediterranean feel is unlike any other hotel in Sedona, Arizona. Reds, located downstairs, is the hot spot in Sedona to dine, hear local live music and hang out with friends and clients. Hardly a day goes by that several members of The Sedona Wedding Studio can’t be spotted having breakfast, lunch, dinner or just having cocktails and hors d’ oeuvres at the dynamic bar. Chef Ron Moler knows his clientele well and personally strolls through the restaurant and bar meeting and greeting guests. His culinary talents are well-known in Sedona, as well as his outgoing charismatic personality that keeps guests coming back for more. Brides are choosing The Sedona Rouge as their destination simply because it has it all. The hotel’s popular Sr. 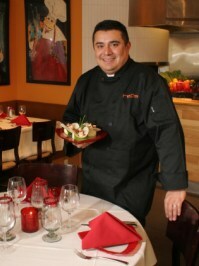 Sales & Catering Manager, Daniel Carrillo can be reached at 928-340-5307. Daniel takes pride in taking care of every detail for his clients. His credentials are unsurpassed in Sedona. Daniel’s charming personality and extensive knowledge of the area, together with his superb experience and background make Sedona Rouge a top consideration for destination brides. The Sedona Wedding Studio is very proud that The Sedona Rouge Hotel and Spa is a member of our exclusive group of superb venues.